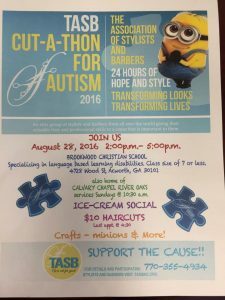 On Saturday, August 27, and Sunday, August 28, we hosted The Association of Stylists & Barbers (TASB) Cut-a-Thon for Autism. Previous Previous post: Ms. Kim is Business Person of the Year! Next Next post: Thank You Dollar General!